People all over the world have been dancing perhaps from the Stone Age. The way in which people dance and their reasons for dancing tell us a great deal about their way of living and thinking. 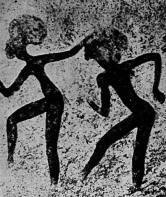 People all over the world have been dancing perhaps from the Stone Age. There are no people who are without their dances, whether one thinks of boomerang-throwing natives in Australia or modern city dwellers with their jazz and pop dances. The way in which people dance and their reasons for dancing tell us a great deal about their way of living and thinking. Similarly the records that reveal how peoples lived and thought in the past help us to recreate a number of the ways in which they danced. What we know about dancing through the ages is largely the result of inspired guesswork-based on our knowledge of tribal people living today, on ancient drawings and carvings, but mostly on what we know of ourselves and our feelings. Most human feelings are instincts common both to sophisticated intellectuals and to the more simple- minded, to 20th-century man and to men living 20,000 years ago. We believe that dancing is an instinct. In other words, something within each of us makes us want to dance. We “dance with joy” if anyone brings us good news, or we “dance with pain” if we bang our thumb with a hammer. In a foreign country we wave our hands and arms in an attempt to make people understand us. It is surprising how many ideas can be expressed in this way. relaxing. The muscles are tensed for leaping and then relaxed as we make what we hope will be a gentle and graceful landing. But clearly dancing must be something organized: it is not enough to jump around in a state of temper, hunger, or excitement. A good answer to the question would be to say that dancing is a way of expressing one’s emotions through a succession of movements disciplined by rhythm. Before any living thing existed on earth, the universe of galaxies, stars, planets, moons, was a great rhythmic creation moving through space: planets circling their suns, moons circling their planets. On our planet, earth, the movement of the earth around the sun, and the moon around the earth, created the rhythms of day and night, of the tides. Later, when living plants appeared, winter and summer created rhythms of growth and decay. In this world evolved ever-changing species of creatures, themselves kept alive by the rhythmic beating of their hearts, the rhythmic breathing of their lungs, the rhythmic swimming, running, or flying of their bodies. 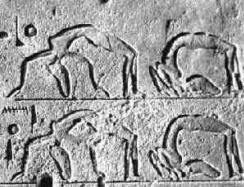 Long before man appeared, many of these animals deliberately danced, as apes, birds, and other creatures still dance. Their dance was prompted by the rhythms of life that pulsed through their bodies and through the universe. Man’s first dances probably began in the same way. Many dances of tribal societies still in existence today are said to be identical to those of birds and apes. Human dancing, therefore, is as old as the first man who expressed his feelings of joy or fear by rhythmically repeated steps or leaps or gestures, perhaps 25,000 years ago. Dancing may well be the oldest of all the arts, and it is an art that needs no instrument other than the dancer’s body. Music came later. 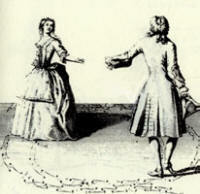 Originally, stamping feet and clapping hands supplied all the “music” and rhythm needed for the dance. woven basket, in the rhythmic repetition of phrases in a native poem or story, in the rhythmically repeated notes of a primitive song. We see rhythm most clearly in the dance – the art of movement whether in the simple leap of the savage or the sophisticated pirouettes of the ballet dancer. Dancing is worldwide, but throughout the world dances differ. In one land only men dance, in another, only women. Elsewhere, men and women dance together in couples. The dance may be quick or slow, gay or solemn. The reason why so many dances have grown up in different parts of the world lies partly in the dancers’ environment: the natural surroundings in which they live. Compare the life of a dweller in a mountain village with the life of a farmer in the valley below. The mountain dweller lives perhaps among hills too steep, too rugged, and too stony for crops to grow in; yet hills that support sheep, goats, or cattle nimble-footed enough to scramble for scattered tufts of grass among the rocks. To survive here the hillman must be a hunter or herdsman, walking many miles a day over the roughest country, his eyes raised to the hill slopes ahead. He develops an alert, springing step, walks with his weight on his toes. The plainsman lives often on a flat expanse of rich soil where crops grow abundantly. His whole life may be devoted to tending the same few fertile acres, his eyes cast down to the earth beneath his feet as he plows, sows, harrows, or reaps. The plainsman develops a slow, heavy tread, walks with his weight on his whole foot. Environment affects not only the way these people gain a living, but the very way they walk. Their everyday movements are enough to suggest that hill dances would be livelier than plains dances. Natural environment makes them even more different: with little level space to dance on, the hillman may develop only springing, leaping steps. On the broad village greens of the valley below, plainsmen have space for running dances, taking up a great deal of level ground. Thus in the Bavarian mountains of southern Germany a popular folk dance in which men would throw their partners high in the air. On the level Russian steppes, dancers form a chain needing a large, flat space for its pattern of horizontal movements. Unconsciously man adapts himself, his way of life, and his dances to the particular environment in which he lives. Dancing may have begun as a rhythmic expression of happiness, but it was rapidly put to “practical” use. If rains failed and fleet of animals fled to distant pastures, the hunter might starve. If wild pigs broke into his grain fields and ate the unripe harvest, the farmer might starve. Like his animal, prey and pests, early man was at the mercy of nature. What he could not make happen with his muscles’ alone, he tried to effect with his mind. He imitated in a dance what he wanted to happen. Before a hunt he mimed a hunt, including the killing of his prey. 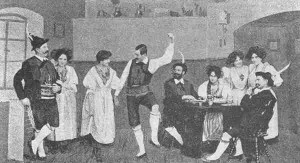 Many early magical dances probably began as pantomime rituals. The steps danced were important to man not because they were beautiful but because they meant something. They had always to be repeated in the same way for the spell to work. 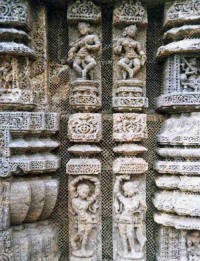 But, with the world’s first civilizations, man’s way of life changed. Better food production, more specialized manufacturers and merchants, supported a leisured class of priests, nobles, and kings. With time, power, and money at his disposal, the king wanted entertainment. Dancing girls performed before him, inventing new, spectacular dances, acrobatic leaps, and handstands – all to please their royal patron. The steps they danced were not important because they had meaning, like those of magical dances in a primitive tribe, but because they were more graceful or skillful than those that ordinary people could perform. Today we still find magical dances in lands where man does not benefit from modern discoveries in science and machinery, where he is unable to control nature’s pests and plagues. We find spectacular dancing in lands where mechanization has produced a class of people with plenty of leisure time and money to spend on the enjoyment of watching experts paid to dance. In almost all ages and all lands we find the dance for pleasure – the social dance – the most enjoyable, active way devised for meeting an old friend or making the acquaintance of a future wife. Most people are gregarious: they like to live in communities rather than alone. Thus the social dance plays its part in palace as well as at village square, is danced by the rich as well as the poor, by the savage and the city businessman. Dance steps grow out of time and place, ever changing as man shapes environment to change his way of life. The steps we dance today are quite unlike the steps we use when running to catch a bus to work. But if we could trace their pattern back through the past we should most, likely find that they once formed the movements of a magic rite. Few dances can be traced in this way. The clues are scattered. Often they seem unrelated to the dance. Who would connect the labyrinth of ancient Crete with the children’s game of hopscotch and the far and older still performed in southern France? Yet the snake-like windings of the farandole of Provence-an ancient colony of Greece-closely resemble a journey to the middle of a labyrinth depicted on an ancient Greek coin. The labyrinth pattern once stood for the passage of a dead man to heaven, a passage fraught with danger from threatening evil powers. 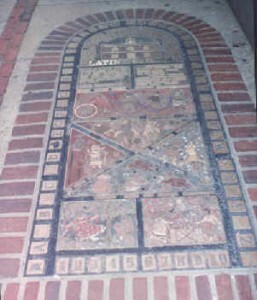 People who performed a funeral dance to the middle of a man-made labyrinth believed they helped the dead man on his way. Though the reason’ for it has long been forgotten, this ancient dance survives both in the “snail shell” into which the leader winds the dancers of a farandole and, indirectly, in the hops on numbered squares of hopscotch-a children’s dance game with a goal. The history of hopscotch is uncertain: some think it started as a Christian rite. Probably it was already old by the time Christ was born, for early Christians inherited pagan ceremonials. Hopscotch is but one of many children’s games that hold the secret of an ancient rite. Other dance steps began in other ways. Many grew not from magic but from work. The sailor’s hornpipe, arms raised above the head, imitates the way a sailor would climb the rigging of a sailing ship. The Swedish weaving dancer includes an imitation of a weaver’s shuttle as it runs between the threads of the loom. dancing was an elegant pastime. Dance steps borrowed from uncultured peasants were adapted to suit refined courtly manners. Leaps became curtsies. A lively folk dance, tamed, became the famous minuet. Clothes too, which differ in different lands and times, play their part in the story of the dance. To cure sickness or bring rain, witch doctors recommended the dancers of the savage tribe-don the dress and mask they think will represent a spirit bringing health or rain. They and their audience believe the dancer becomes the spirit that he imitates. He “sheds” his own body for a body and mind of superhuman power. on masks and costumes. No one believed the courtier became the black moor whose dress he wore. But costume lent extra excitement to the entertainment of the dance. It plays the same important part in ballet today. In ballet, steps are ordinary movements changed by rhythm and emotion into art. The ballet story may consist of ordinary events selected to make an artistic tale. Ballet costume helps the dancer to lift both steps and story from everyday life into another world: one of artistic make-believe. Through the centuries, costume has not only lent excitement to dance, it has helped to create dance steps. Traditional everyday dress, often heavy in colder climates, scanty in the tropics, plays its part in shaping folk dance, which affects all other social and spectacular dances. Full skirts give rise to thrilling, whirling movements; heavy skirts and wooden shoes to stamping steps. Austrian mountaineers’ shorts encourage the thigh-slapping schuhplattler dances. Thus the story of dancing is not just a catalog of steps or a museum of costumes. To understand it we must know where people live, how they live, and why they change their ways of life.